How bright and fun is this rainbow striped skirt? I love something with a lot of color that I can play with. I can also wear it with black, white, orange, red, blue, teal, and hot pink! It’s a satiny material that feels really nice and oh so, girly. The top is a ribbed summery sweater with a trendy criss cross detail in front. I love this blush pink, though to be honest it’s hard for me to wear close to my face. But as long as I make myself up, it’s do-able. And again, oh so girly! Of course I needed to add my red patent leather pumps. They just seemed so perfect with this! Also my white Rebecca Minkoff bag, Topshop sunnies, and Kendra Scott earrings. Sticking with the striped theme, I chose Andrea of Andrea’s Wellness Notes to feature this week. Loving the stripe mixing perfection! Ready for the July 4th weekend, Dolls? Any fun plans? Do you have your outfit prepped? And hey, you don’t need to be an American to celebrate … who doesn’t want to wear red, white, & blue and eat too much and watch fireworks?! PS: Did you see my feature in You Look Fab?! Love this website! We are going to LA this weekend—it’s going to be a Fierce 50 fun time!! That outfit is THE perfect outfit for you, Dawn Lucy. I love it. Bit fifties, isn’t it? And yet totally modern. Fabulous. Wow, wow and wow! This skirt is beyond fabulous and you sparkle like a diamond in it! Love your hair too! You are a beauty, a true beauty! Love the skirt. Sorry to see the size small is already sold out. That skirt is fabulous! Love all the colors! Love, love, love this skirt! And the red pumps make it sizzle! Such a lovely outfit and those red heels ~ so lady like !! Stunning skirt! Love the stripes. Really love this look! Fabulous skirt! Lovely skirt. I’m partial to stripes too.dots and spots come close too. Love your stripes, Dawn! Thanks for the link up and have a wonderful weekend! Love the stripes!!! I hope you have a wonderful weekend! I totally agree about the circus ballerina look but so much chicer! The stripes makes me happy and I adore all the colors. Thanks for the link up! That skirt is fabulous! Love the rainbow of stripes! I’m also loving your hair in a topknot! Enjoy the weekend! That skirt is just so fun! Midi skirts like this are without a doubt my favorite. Your fashion is always so much fun! Love the striped skirt! All your skirts have been so amazing lately! You wear that style perfectly! Thank you for joining Ladies Who Link Up today! Peace! I LOVE this!!!! Fabulous skirt! And great photo shoot. You really know how to make a midi skirt look fun and amazing. Love the bright colors and your hair up looks adorable! I love those rainbow stripes! This is a great summer outfit!! Fantastic look! Your skirt is so pretty and I am loving your top knot! Beautiful skirt! Love all these bright colors on you! Thanks for the linkup! That skirt! So gorgeous on you! Love the whole retro vibe! Very pretty! So love the striped skirt, especially paired with your red pumps!! And, also your hair up is stunning. Thank you for hosting! I absolutely love your skirt! Those colors are beautiful! 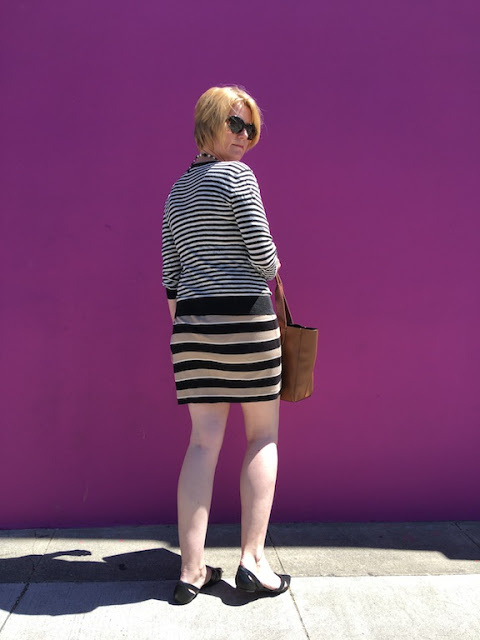 How fun is that striped skirt?! Too cute, i’m over here imagining all the different outfits you could make out of it! Hope you have a great weekend! that skirt is the most fabulous thing I have ever seen! Aww. .. hee … thanks!! What a fun skirt, and it looks great on you! Dawn Lucy, I am dying over this skirt! It is simply adorable. And a circus ballerina is the perfect description! I do need to find myself a pair of red patent pumps or red heels of some sort! I do believe they are a must-have for every girl’s closet! Thanks for the link up and have a f bulous weekend. This outfit is so fun. Love it ❤️ Wish you a great holiday weekend, I live in Norway so we’re having a normal weekend. I LOVE your skirt! Perfect stripes! You look absolutely fabulous! Thanks for the feature! You made my day! What a beautiful skirt Dawn, love the whole look 🙂 Thanks for sharing at Creative Mondays. That striped skirt is so pretty! Oh my goodness this skirt is too fun! Love your hair in this precious top knot!